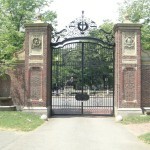 Finding Money for College, Even if your Credit is "Ruined"
Harvard Gate...No, he's not considering Harvard. It is hard to see friends having troubles.Â It is even harder when there is nothing more than you would like to do but help, but there is nothing in your power to do so.Â My friend Max (fake name) mentioned that his credit is “ruined”.Â I knew that he was having some money struggles, but had no idea how severe it was.Â After he informed me that he has not even paid the minimum payments on his credit cards in months and that he was considering bankruptcy, I started to realize exactly how dire his situation was becoming. I gave him what advice I could, but there is not a lot I can tell him when I know that he is making barely enough to eat and pay rent.Â Max also mentioned that he is hoping to go back to school.Â Obviously, if he does not have the money for his rent, he can not pay up front for college.Â His idea was that in addition to working, his student loan money would supplement his income enough so while getting his education, he could also pay bills.Â In his mind, it is a win/win situation.Â After his education is finished, he will be able to get a higher paying job, live comfortably and pay off the loans that helped him live through his college years. I am torn on his mindset.Â I would prefer to further my education without incurring any debt, but that is not ideal for all.Â Educational debt is not always considered “bad debt”, but it is more of an investment than most debt. After our conversation, I decided to check out just how hard it will be for him to get a student loan if his credit is in fact “ruined”.Â Although I do not endorse him living on student loans, I know him well enough to trust that he will use this money wisely and make himself more intelligent and marketable in the process. There are many different options when funding education.Â There are federal grants, state grants, and loads of different loan programs. This is usually the first stop for students.Â Â A relatively simple application process will let you know how much federal money is available to you for college.Â Upon finishing the application, a combination of grants, loans and scholarships will be offered.Â Keep in mind that this application will not automatically get you all of the money necessary for tuition, books and other costs associated with school.Â For more information about FAFSA, check out the official government site, and for questions about FAFSA, check out this FAQ page. Good news for Max, credit score is a non-factor on the FAFSA application approval process. Stafford loans are federal loans set at a fixed rate and are offered by the Government.Â In order to be eligible for Stafford loans, you have to have also applied for Federal Student Aid through FAFSA or submitted a renewal FAFSA application.Â These loans are beneficial because payments can be deferred until after graduation with minimal fees. Grants and scholarships should be your first priority when attempting to get money for school.Â Sometimes grants can be granted for little more than writing an essay.Â These funds do not need to be repaid and can often be used for school costs not directly related to tuition. Private loans from any institution are the riskiest of funding methods for school.Â Outrageous interest rates, poor terms or just a bad loan overall can make for a nasty experience.Â If Federal aid and Stafford loans are not enough to help you get by while in school, use private student loans as an absolute last resort.Â There are literally thousands of grant and scholarship programs that go unclaimed every year.Â I recommend applying for every one of these possible before resorting to a private loan. Should Max go back to school and take advantage of loans to help him with the costs of everyday life?Â I believe so.Â Although this will not be the best solution for just anybody, Max will have the drive and determination to get himself through school and come out better for it in the end.Â He also has a great support system around him that will enable him to trudge through the tougher times.Â What do you think?Â Did you have a similar experience funding college?Â Perhaps you found other methods to obtain money while in school. Finaid.Org-A privately owned LLC that provides various methods of obtaining money for school through loans, grants, federal programs, savings plans and much more. Fastweb.Com and Collegenet.Com both have scholarship search engines.Â Both of these sites are very reputable and can be trusted…beware of scams when searching for scholarship money and try to use only sites or resources that are recommended.